Microbial natural products have been an important traditional source of valuable antibiotics and other drugs but interest in them waned in the 1990s when big pharma decided that their discovery was no longer cost-effective and concentrated instead on synthetic chemistry as a source of novel compounds, often with disappointing results. Moreover understanding the biosynthesis of complex natural products was frustratingly difficult. With the development of molecular genetic methods to isolate and manipulate the complex microbial enzymes that make natural products, unexpected chemistry has been revealed and interest in the compounds has again flowered. 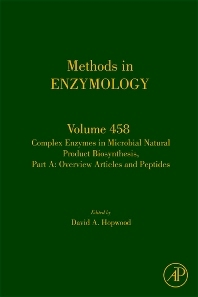 This two-volume treatment of the subject will showcase the most important chemical classes of complex natural products: the peptides, made by the assembly of short chains of amino acid subunits, and the polyketides, assembled from the joining of small carboxylic acids such as acetate and malonate. In both classes, variation in sub-unit structure, number and chemical modification leads to an almost infinite variety of final structures, accounting for the huge importance of the compounds in nature and medicine. Gathers tried and tested methods and techniques from top players in the field. In depth coverage of ribosomally-synthesised and Non-ribosomally-synthesised peptides. Provides an extremely useful reference for the experienced research scientist. Researchers in cell, molecular and developmental biology; biochemists, pharmacologists, geneticists.